Buellton is a small town north of Santa Barbara, California. It is right next to the 101 freeway and it provides very easy access to the California central coast area. However, there is not much to see and do in Buellton itself, but the area around Buellton is full of natural beauty and tourist attractions. We really enjoyed Buellton as a stop on our drive from Pismo Beach back to Southern California. Read more to find out about Buellton, California. Buellton is a small California town located north of Santa Barbara. If you drive north of Santa Barbara you will see lots of signs off the freeway with adverts for Buellton and Solvang. If you want to simplify things, Buellton is on the left of the freeway while Solvang is on the right of the freeway, if you travel North from Santa Barbara. So, it’s very easy to get to Buellton. Map of Buellton, California and surrounding area. See more pictures from Buellton, California. Have lunch or dinner at the Andersen’s Restaurant. You have to try their pea soup and see if you like it. It’s very famous soup. Stop and feed the emus and ostriches at Ostrich Land. If you have time, drive 5 more minutes to Solvang. Read my travel guide for Solvang, California for more cool things to do in Solvang. 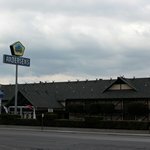 This restaurant is what makes Buellton famous. If you ask anyone in Southern California if they have heard about Buellton, they will tell you about Andersen’s split pea soup. Well, this is the place where you can taste this famous soup. The restaurant is very nice inside and it has a pleasant atmosphere even though it is somewhat outdated. Andersen’s split pea soup was…salty for me. It has a very nice texture, but it was a bit too salty for me. However, we ordered some sandwiches for lunch which were very good. Buellton, California – People enjoying lunch inside Andersen’s Restaurant. Feed the big birds at Ostrich Land farm in Buellton, California. If you have a little more time and especially if you have children, go over the freeway and stop at Ostrich Land. For a few dollars you get some food and a pan and off you go. You will definitely be very entertained as you feed these big birds. For some reason they are always hungry, so you have to be careful and not drop the pan. These birds are very powerful so use both arms to hold the pan. Our kids enjoyed much watching me be very scared of the birds. However, the food does run out very quickly, so maybe you want to buy some more. Buellton, California – Ostriches eating vigurously at Ostrich Land in Buellton. Is it worth visiting Buellton, California? We found Buellton to be a great stop when we came back from Pismo Beach. We spent about two hours in the area and were very relaxed for the rest of the trip back. Our kids also enjoyed stopping and stretching their legs and looking at the ostriches. All in all, Buellton is a great stop for the California traveler.